Birth Injury Lawyer > Recent Birth Injury News > Birth Injury > Could a Failure to Adequately Respond to Alarms during Labor and Delivery Have Caused Your Baby’s Birth Injury? Alarms on monitoring devices in hospital obstetrical units regularly go off during a woman’s labor and the delivery of her child. While some of these alarms may signal serious danger to mother or fetus, others may be false alarms that do not signal danger but that still require prompt response to ensure patient safety. When an overabundance of alarms routinely go off, however, nurses can become desensitized to the sound and are more likely to fail to respond to alarms that warn of maternal or fetal distress. A hospital’s failure to establish and enforce adequate alarm protocols and nursing-staff negligence in responding to alarms can lead to birth injuries that could have been prevented. Birth-injury lawyer Jeffrey Killino and his nationally recognized team of birth-injury lawyers have extensive experience with birth-injury cases, including those arising out of injuries caused by negligence in the establishment of and response to alarm protocols. If your child has sustained a birth injury, contact us for more information about your legal rights and options. Who Can Be Held Liable for Birth Injuries Caused by Inadequate Alarm Protocols and Negligent Response to Alarms? The frequency with which alarms sound in obstetric and neonatal units has led to what many refer to as “alarm fatigue” in nurses and other hospital personnel. The problem is made worse by the fact that most of these alarms are “false alarms” (triggered by such things as patients’ position changes) that do not signal any patient danger. Knowing this—and experiencing sensory overload—hospital personnel often tune out many of the alarms and may miss those signaling true threats to a mother or fetus. Improvements in the management of alarm systems, the integration of multiple alarms, and the education of nurses and other hospital personnel in their use and response are crucial to the protection of patient safety and the prevention of birth injuries caused by inadequate alarm responses. Hospitals are well aware of (or reasonably should be aware of) the hazards posed by alarm overload and have a duty to establish and enforce protocols that will result in safe and timely responses to alarms that signal maternal or fetal distress. In addition, nurses and other medical personnel assisting in a child’s birth have a duty to exercise reasonable care in their responses to obstetric-unit alarms, regardless of the adequacy or inadequacy of established alarm protocols. A hospital’s and/or medical professional’s failure to fulfill these duties to their patients may result in their liability for birth injuries determined to have been caused by such negligence. Birth-injury attorney Jeffrey Killino is known throughout the country for his dedication to holding those responsible for preventable birth injuries legally accountable. 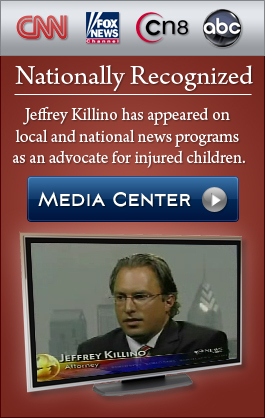 If your child was born with an injury of any kind due to medical malpractice, attorney Killino and his highly skilled team of birth-injury lawyers can help you obtain the compensation you deserve.